UMKC Assistant Professor of Engineering Travis Fields (left) pilots the drone to obtain video footage and images of the floor beams and stringers while MEC Project Engineer Dustin Berry (right) provides directions and feedback. 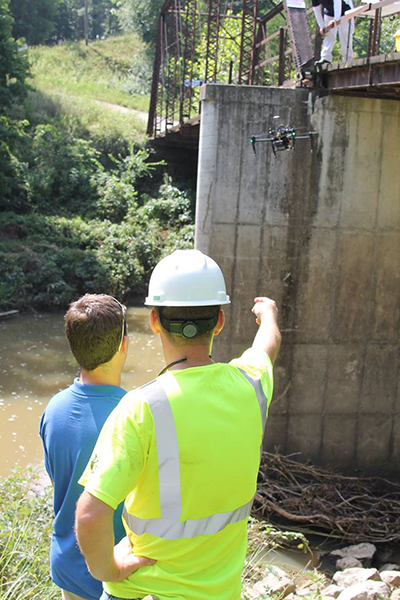 When completing a fracture-critical inspection on a 100-year old bridge in Boone County, Missouri, McClure Engineering Company (MEC) partnered with the University of Missouri-Kansas City (UMKC) to collect inspection data more safely and efficiently using a tethered drone system. The collaboration began in 2015 after a Missouri Society of Professional Engineers (MSPE) Western Chapter meeting during which Assistant Professor of Engineering Travis Fields presented on his tethered drone prototype. Through the partnership, UMKC was able to test their provisionally patented system in the field and receive expert feedback from bridge inspectors, while MEC was able to enhance its data collection and experience with drones. While last year’s prototype had image contrast issues and could not get close enough to the bridge structures to collect usable data, this year’s model was able to be used to view the floor beams and stringers on the bridge and determine whether there were structural issues that required further inspection. During the inspection, the camera on the drone streamed 4K video that engineers saved for review. When viewing particular areas and critical connections, MEC directed Fields on which high-resolution images to capture, and several of these images were included in the final bridge inspection report. Fields has worked with Associate Professor of Civil and Mechanical Engineering John Kevern to develop their tethering system, which makes the drone unique. The tether, which connects the drone to a gas-powered generator is lighter than the onboard battery and makes the flight time almost unlimited while also eliminating the risk of a runaway. Ither applications of the technology for inspection may include other structures, such as water towers and utilities, as well as the possibility for adding LiDAR (light detection and ranging) scanners to the drone to enhance data collection.